Pyramid Hotels is beautifully laid out on a large expanse of land within the ambits of the Calabar city centre. The external aesthetics complement the elegant interior and excellent lodging services it offers to guests. Pyramid Hotel is a 20-room facility situated at Plot 117, Murtala Mohammed Highway, Odukpani, Calabar about 12km away from the Margaret Ekpo International Airport. 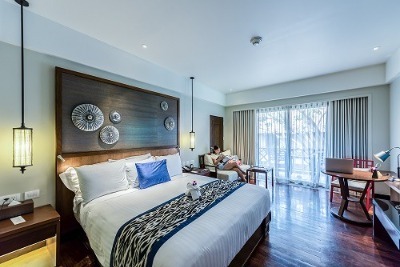 The guest rooms are comfortable and spacious, providing a view of the lush vegetation of the city. In-room features include LCD TV sets with satellite channels, telephone systems, air conditioners, chair, worktables, telephone and en-suite bathrooms. Guests can select from within the room categories of Mini Single, Deluxe, Standard Single, Standard Double, Mini Suite, Standard Suite and Family Suite. Wifi connectivity is available in all the rooms. The on-site restaurant provides African and Continental meal options while the bar presents a perfect relaxation spot with assorted drinks. A well-equipped fitness centre is available on-site where guests can have a perfect workout session. Other facilities include ample parking space and an event hall, perfect for individual and corporate functions. Available on request at Pyramid Hotels are laundry, car hire, concierge and room services. Q: Does Pyramid Hotel offer complimentary breakfast? A: No, guests are charged for breakfast orders. Q: Does the hotel offer free internet access? A: Yes, free Wifi is available in all the rooms. Q: Does Pyramid Hotel have a swimming pool? A: Yes, there is an outdoor swimming pool within the hotel complex. Q: Does the hotel have a gym? A: Yes, this facility is available. Q: Does Pyramid Hotel have cribs for children? A: No, this facility is unavailable. Pyramid Hotels is a budget hotel in Calabar, Cross River. The satisfaction I had at Pyramid Hotel was far beyond my expectation. I enjoyed every bit of my stay. The room was beautifully furnished, the air condition worked perfectly well, the room service was responsive and the water supply was good. Pyramid Hotel is a nice hotel. Lovely hotel, very neat, quiet and well maintained. Their services are great and the rooms are spacious and neat but the only issue I had was that mosquitoes actually disturbed me at night. I think something should be done about this as soon as possible. I like this hotel actually and would like to visit again but the management should try and fix this. I did not like the hotel at all. The hotel was very bad. The customer service was extremely bad. My room's window net was torn and a lot of mosquitoes came in for a feast. The environment was very conducive and ready to accommodate people but the hotel staff were not ready to accommodate. If I were to rate the hotel, I will rate it 5 out of 10. I expected so much from this hotel and got very little. The toilet was licking, the bed spread and pillow was dusty, the facilities in the hotel needs complete over-hauling. Although, the hotel attendant that attended to me was friendly and polite, the hotel management should please put every other thing in place. Have nice pictures of Pyramid Hotels ?